The range of Arts classes and opportunities for our High School & Middle School students is, in a word, inspirational. If you have an artistic passion, we will be able to help you take your skill to the next level. Middle School art is the exciting bridge between the basic design elements learned in the Lower School and the advanced practices taught in the Upper School. Students are encouraged to think with a critical mind, follow specific design objectives, and hone their craft in different art mediums and subjects. Students achieve success through the correct use and manipulation of materials: charcoal, pastel, acrylic paint, printmaking, ceramics, as well as more process oriented projects: gridded self-portraits, still- life observation drawings, and design collage. The biggest challenge for Upper School Visual Art students is deciding which of our amazing classes to choose. Studio Art, Ceramics, Photography & Graphic Design all offer exceptional instruction and settings to fully develop whatever you are passionate about. It is hard to step inside our painting studio and not be inspired. Likewise, our dedicated ceramics studio (complete with throwing wheels and kiln), allows students to experience and explore an artistic outlet they may have never tried before. 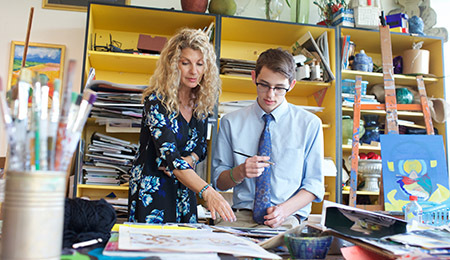 Whether just exploring an artistic interest or developing a portfolio for an AP Studio class, we will make sure you receive all the support and guidance needed. Middle School provides the chance for students to explore interests in band or chorus - each allowing for may elect to attend band and chorus classes. 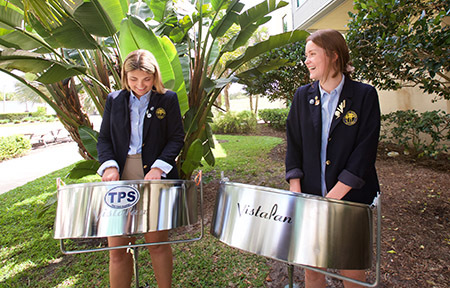 Upper School students can take those learned skills and apply them to a range of unique Pine performance ensembles - including Concert Band, Chorus, The Pine School Jazz Ensemble or The Knights of Steel "Steelpan" group. The focus of all of our ensembles is performance. Students are encouraged to perform at events throughout the school year, enter competitions, and take part in a range of Honor Band assessments. Drama at The Pine School is really another unique opportunity for the School community to come together. Students in 5th Grade up are encouraged to participate in the school’s annual musical. 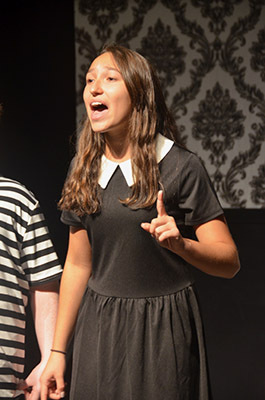 Besides roles on stage, which enhance students’ confidence in their acting, singing, and dancing abilities, students also have the ability to assist in the many other aspects of a production - from stage management to more technical aspects such as lighting and costume/make-up design. Our productions are as fun to watch as they are to be a part of. With the addition of our upcoming performing arts center, productions will be enhanced - providing additional opportunities for students in front and behind the stage.